Morellet studied at the Ecole des Langues Orientales in Paris while he simultaneously began his artistic training, partly self-taught and partly guided by tutors. His early paintings (landscapes, portraits and still lifes) were exhibited in his first solo show at the Galerie Creuze (Paris, 1950). Later that year he traveled to Brazil where he saw Max Bill’s work and was exposed to Concrete painting. After returning to France in 1951 he decided to pursue abstract art. During a visit to Spain in 1952 the tiles and mosaics of the Alhambra in Granada inspired him in his works to repeat patterns with minor variations. In his early geometric abstract paintings he used simple shapes (lines, triangles, squares and grids) to design uniform series. While developing these ideas, he continued to study the work of other artists looking for inspiration in the art of Marcel Duchamp, Piet Mondrian, Ellsworth Kelly and Victor Vasarely. 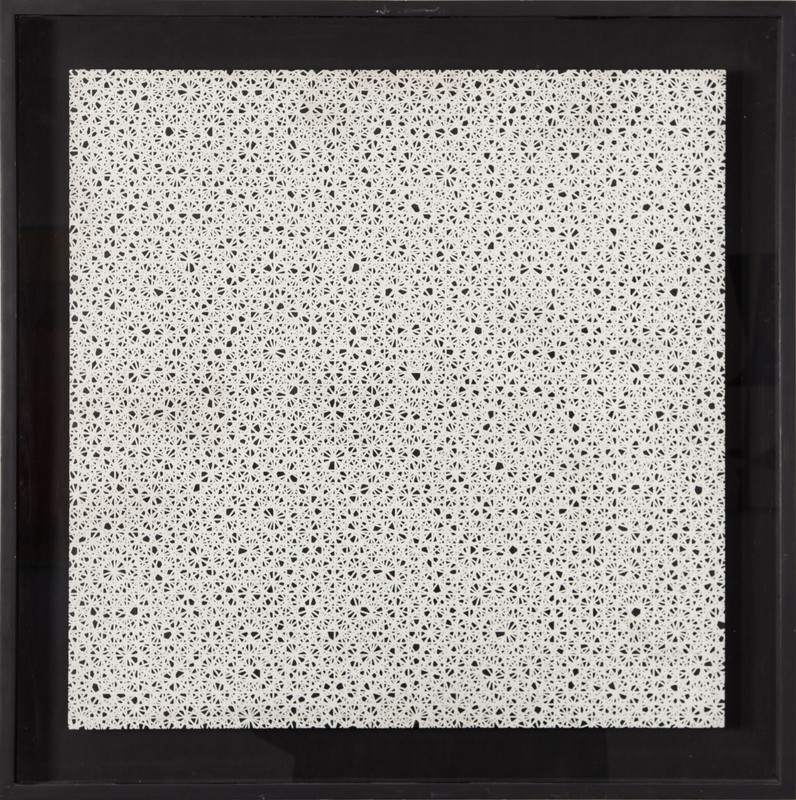 In contrast to the romantic subjective conception of art Morellet developed methods and formulas to control the composition of his works by applying pre-established principles or chance. He followed his own simple mechanical instructions and rules to avoid any influence that could possibly affect his sensitivity. Thus arose the first Systèmes, which he titled in a playful or even Dadaist attitude in order to reveal the method used in their production (6 répartitions aléatoires de 4 carrés noirs et blancs d’après les chiffres pairs et impairs du nombre Pi, 1958). Morellet began to move away from the two-dimensionality of painting and to favor the space afforded by installation art. In 1960 he co-founded the Groupe de Recherche d’Art Visuel (GRAV), with Julio Le Parc, Hugo Demarco, Horacio Garcia-Rossi and Jean-Pierre Yvaral, among others. The group collectively addressed artistic creation and seeking the individual anonymity. Morellet researched the active and playful participation of the viewer in happenings and street actions as well as the production of new art objects with kinetic, technological, and interactive features. In 1962 his search for new materials led him to produce his first aluminum spheres. In 1963 he began to use neon lights in his compositions, a material that caught his attention because it was already manufactured or readymade. It not only generated a cold and impersonal light but it also could be turned on and off rhythmically when interacting with the viewer. His first Néons were presented inside the maze installed by the GRAV at the III Paris Biennial (1963). It was a closed rectangular space divided into different sections in which the public was allowed to manipulate and activate various works made by the group. In 1968, the year of the dissolution of GRAV, Morellet created Adhésifs éphémères. This intervention consisted of using black adhesive tape on different surfaces including nineteenth century sculptures exhibited in museums and galleries where he presented his solo shows or in nearby spaces in order to integrate such works into his own. From 1971 on, he received numerous commissions for public spaces. Among them the series Désintégrations architecturales stood out for its originality. Although it promoted a sort of architectural integration, it paradoxically presented monumental fragments separated or disengaged from previously built units. Among the large collection of works Morellet designed for public spaces were ones commissioned for the Plateau The Reynie (Paris, 1971), the Ecole Superieure the Armée de l’Allemande (Hamburg, 1977), the Centre Culturel de Comoiègne (1979), the Kröller-Müller Museum Park (Otterlo, 1988), La Défense (Paris, 1991) and the Musée du Louvre (Paris, 2010). In his Tableaux déstabilisés (1973Morellet studied the interaction between line and space through planks that altered the relationship between the floor and the wall. In Géométrees (1983) he integrated tree branches and geometric shapes to give the works a dual and disparate character with relation to materials while giving a unitary character to their form and composition. In 1992 he began the new series Systèmes, including Relâches, works made of right angles of different colors and materials whose location on square canvases was given by random numbers. In 1996 he produced the Lunatiques series in which the right angles and the square brackets were replaced by neon tubes, semicircular tree branches, circular supports, and spiral layouts. In Déclinaisons of π (1996), the sculptural systems were made up of segments of lines or circles articulated according to angles obtained randomly from the number π. In the Décrochages and Lamentable series (2000-2005), neon tubes seemed to have lost their fixed disposition as they were shown fallen or dislocated in an unexplained disorder. Towards the end of his life, Morellet’s work was the subject of numerous retrospectives that confirmed his reputation. Among them were shows at the Musée des Beaux-arts (Nantes, 2007) and the Centre Georges Pompidou (Paris, 2011). In Nantes he used the tracing of one of his linear paintings to create a maze-like path that filled the exhibition space and led the visitor to selected works. Anna, S. François Morellet. Installations/Catalogue raisonné seiner installationen. Chemmitz, 1994. Blistène, B. y Grenier, C. (eds.). Paris: Centre Georges Pompidou, 1986. François Morellet. Berlin: Nationalgalerie, 1977. François Morellet: quelques systèmes en hommage à Herbin. Le Cateau-Cambrésis: Musée Matisse, 2003. Kotik, C. y Van der Marck, J. Buffalo: Albright-Knox Gallery, 1984. Lemoine, Serge. François Morellet. Dessins. Grenoble: Musée de Grenoble, 1991. Lemoine, Serge. François Morellet. Paris: Flammarion, 1996. Morellet, François. Mais comment taire mes commentaires. Paris: Ensba, 1999. Paris: Galerie Nationale du Jeu de Paume – Réunion des Musées Nationaux, 2000. Oelschläger, P. (ed.). François Morellet. Hannover: Sprengel Museum, 1992. Réinstallations. Paris: Centre Georges Pompidou, 2011.